With the assurance from Apple Inc. that iCloud data warehouse is untouchable, many iOS users have sent their irreplaceable photos and videos to iCloud for backup. 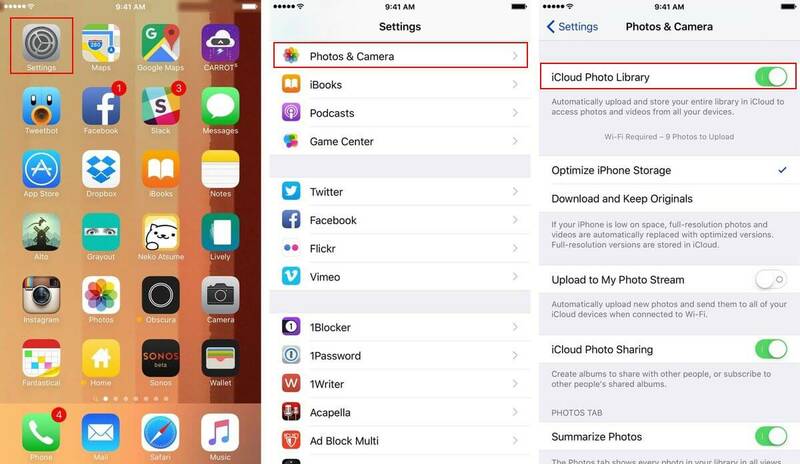 However, many of us do not know how to backup photos to iCloud, how to access iCloud photo library, how to use iCloud photo streaming features, or how to back up iCloud photo library. This part teaches you how to backup photos to iCloud as well as other files in 30 seconds. Step 1: Connect your iPhone to Wi-Fi network by clicking Settings > Wi-Fi. Slide to Wi-Fi to ON position, and it will turn green. Then select a Wi-Fi network and add a password if prompted to do so. Step 2: Backup your iPhone to iCloud by clicking on Settings > Apple ID > Sign into your iPhone. Enter your Apple ID and password, then tap Sing-In. Step 3: Go back to Setting app and launch it again, click iCloud. Step 4: On the listed apps, you’ll see a switch button, slide it On to include such apps as the backup. 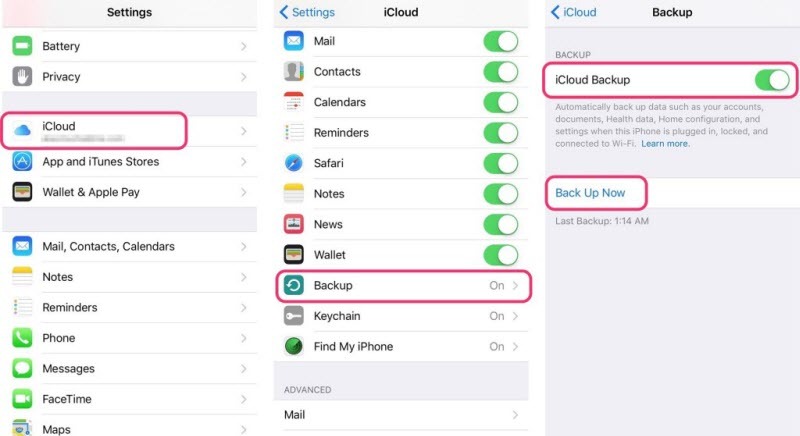 Step 5: Click iCloud Backup, then slide iCloud Backup to On position, then click Backup Now. That’s what we want to know about how to backup photos to iCloud. iCloud photo library works seamlessly with iOS photo app to keep your photos safe and available on all your devices. When turned on, it automatically uploads your photo collection to iCloud each time your iDevice is connected to a Wi-Fi network or a cellular network and your battery charged. Step 1: Click Settings > Photos. Step 2: Touch the switch button On and it will turn green. That’s also an answer of how to backup photos to iCloud. Have you ever asked yourself when you use iCloud to backup your photos, where do your photos go? How much of your privacy is protected? And what would happen to your photos if an error occurs during syncing? If these questions bother you, you may do not want to know how to backup photos to iCloud, but need to find a smarter way to back up your data. iMyFone TunesMate is a PC-based iOS device transfer tool that you can use to freely back up your data without going through the stress of iCloud. With TunesMate, you can back up all your iPhone data to your iTunes/PC, and transfer such data from your backup folder to any other convenient folder for safe keeping. Two-way transfer: Transfer from computer or iTunes to iPhone, or from iPhone to PC/iTunes. 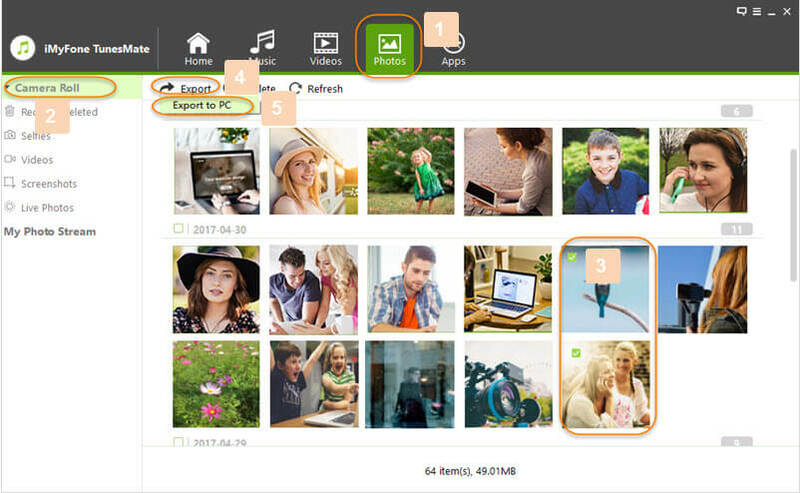 Easily backup data such as photos, documents, videos, files, etc. from one iDevice to a computer or other iDevices. Backup media files such as podcasts, home videos, music videos, iTunes U, and other files that iTunes cannot transfer or will restrict you from transferring. Offers mass backup and deletes features for all iDevices. Supports different versions of iOS for both Windows and macOS and different models of iDevice. Step 1: Connect your iPhone to your PC using a USB cable, and launch iMyFone TunesMate. Step 2: Click Photos tab, and select photos to export to your computer by checking them. Then click Export > Export to PC from the drop-down menu. 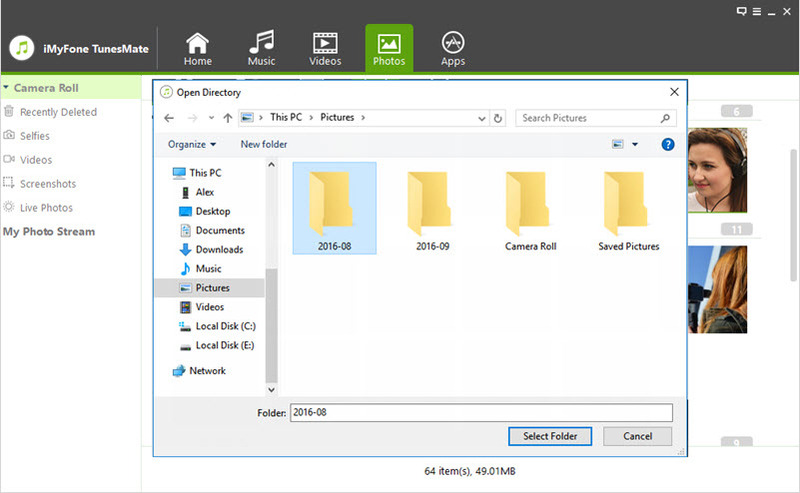 Step 3: Choose a target folder on your PC to save your photos. Click Select Folder. Your photos will now be backed up on your PC. Apple Inc. is well known for its easy to use Operating systems especially the iOS, but the inclusion of new services such as how to backup photos to iCloud, iCloud Photo Library, Camera Roll, and Photo Stream made a few things uneasy. Photo Stream and Camera Roll: Photo Stream and Camera Roll are not the same services; Photo Stream contains iOS photos synced across all your Apple devices connected to the same iCloud account, while Camera Roll is photos stored in your iPhone’s storage space. The Photo Stream service is not a backup service, it’s just for you to access your photos across all your iOS device when the service is turned on on all your devices. Hence, your Photo Stream service does not save your photos but makes them available on all your Apple devices. iCloud Photo Library: The iCloud Photo Library works like Photo Stream but with a little difference. The difference is that iCloud Photo Library automatically syncs your iOS photos across all your devices while saving them in iCloud. On Mac, the iCloud Photo Library can be accessed through your Photo App. More so, any edit you make on any of your devices will reflect on all your other devices. Storage and Backup: iCloud offers a comprehensive file backup than other Apples syncing and streaming services. It lets you backup all your iOS data and files such as documents, photos, videos, games, settings, and more. Now, with all these services, you may be getting confused on the right data backup service to subscribe to. You should also have some level of control over where you send your pictures because of the level of vulnerability in iCloud with respect to the recent celebrity attacks. It’s as important as the method how to backup photos to iCloud.